Earn up to $150 for each new customer you refer to Kasamba for a free psychic reading. When you introduce your audience to Kasamba, our psychics will help them find their way to love and happiness, and you’ll get paid. Since 1995, over 2 million users have made Kasamba their choice for psychic readings, tarot readings, astrology and more. 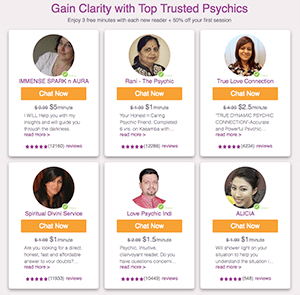 Using our website, mobile site, or calling toll-free, our customers have 24/7 access to thousands of top-rated psychics for readings via text chat, phone, and email. We provide you with everything you need to start earning money today – ads, landing pages, coupons, and special offers that we have optimized through years of testing. Our affiliate marketing solution tracks your earnings and statistics in real-time. Make up to $150 USD for each new customer! $125 for 1 - 99 new customers per month, $150 for 100 and greater. Interested in becoming a Kasamba Affiliate Partner? Have an Account Manager contact you! Place our text links, banners and other creatives on your website, emails, mobile apps, social networks and other properties or assets, online or even offline. New customer has paid psychic reading anytime within 60 days of registering for Kasamba for the first time. Earn up to $150 for each new paying customer. We pay Affiliate commissions monthly! Click Here to read our Affiliate Agreement. It’s FREE & Easy to get started promoting right away with a Kasamba Psychic Grid, our best converting creative for Affiliates! Click Here to view live Kasamba grids using our API. New Customer: is a user that registers as a Member for the first time within 60 days of the user's visit to the Kasamba website, who is over 18 years old, enters a valid credit card or valid PayPal account details, and sends at least one paid email or engages in at least one live paid session with an advisor through the Kasamba website. A New Customer may not have any other accounts registered on Kasamba under a different name, email address, or phone number.